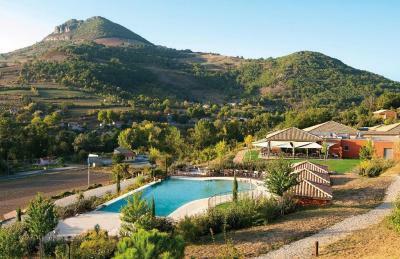 Lock in a great price for Domaine Saint Esteve – rated 8.3 by recent guests! Location. Easy to get to and near many sites to visit. We came to see the Millau Viaduct, which is visible from the hotel. The on-site dining room was convenient, but the service was a little slow. The grounds were beautifully landscaped. The service was over the top, good was very good. Given the price point, this was an exceptional experience. We intended to stay one night, then added another and in the end stayed give. Caveat, stay in the 2 bedroom, the 1 bedroom gets a little cramped and the price difference is nominal. Front desk service was friendly, the restaurant and bar area were very clean and the personnel, as well as the food were very good. 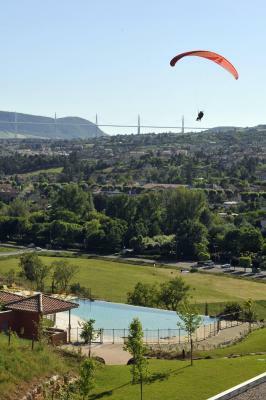 The view offered of the bridge at Millau is excellent. The location is great, rooms where a little bit small but further ok.
We were the last guests of the season but were welcomed as the first!! The accommodation was brilliant for our needs and the breakfast was fantastic. The guy who greeted us in the morning couldn't have done more for us..top marks to him, and to the site. We were on our way home after an exhausting three week trip to Spain ( yea I know ) and wanted to see the Millau Viaduct. If you want to see the bridge...make a holiday of it and stay here. Thanks to all concerned. 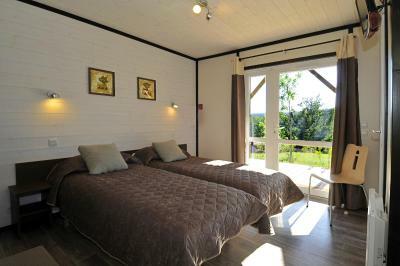 Beautiful set up with en suite bedrooms in their own chalet with a terrace. Rooms were clean and spacious with minifridge. Breakfast was plentiful and varied and good value for money. 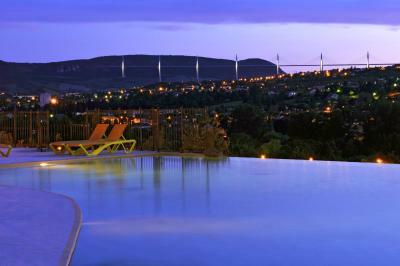 The pool was so lovely with simply stunning views of the bridge and valley. One of our top picks in Millau.Offering an infinity pool, this residence is located on 4.5 hectares, 5 minutes' drive from Millau city center. 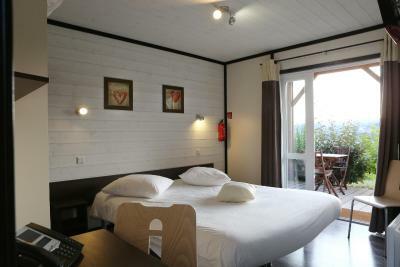 A furnished terrace and a mini-fridge feature in the rooms and the chalets. Guests can relax watching an LCD TV in each accommodations which also has a private bathroom. 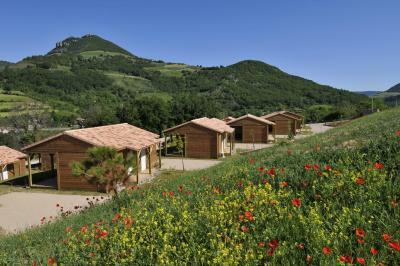 Some chalets include a dishwasher, stove and a coffee maker. 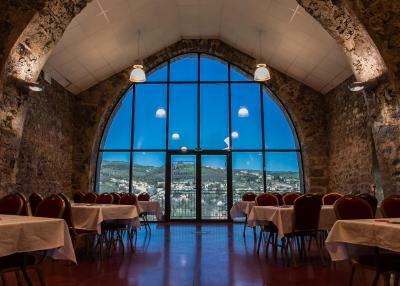 The bar offers cocktails and local wines, and in the morning, a buffet breakfast is served in the restaurant with views of the Viaduct. 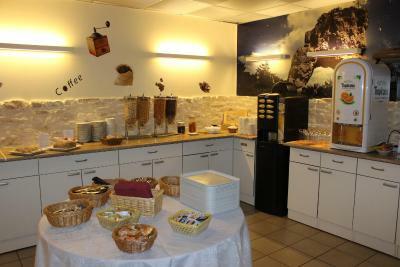 All year round, facilities include fresh bread and pastries sold in the morning. Free private parking is available on site and exit 45 of the A75 Motorway is just 6.8 mi away. Buses also have dedicated parking spaces. Staff at the reception can advise you on what to do and see in the area. 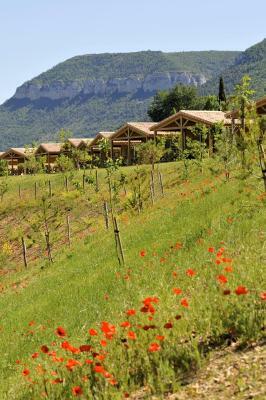 When would you like to stay at Domaine Saint Esteve? 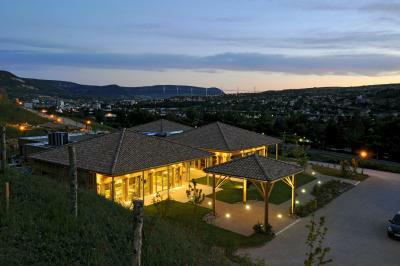 This room is located on the upper part of the estate, near all the residence's services and facilities. 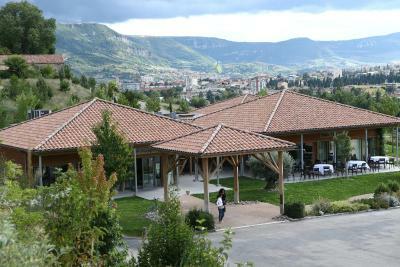 It has a terrace with a view on the Millau Viaduct. 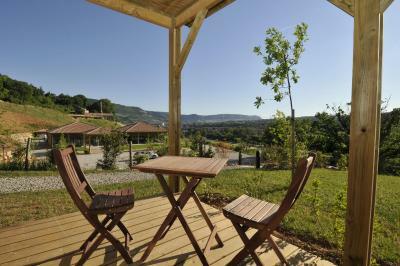 Located on the upper part of the estate, this chalet has a terrace with a view of the Millau Viaduct. It offers 2 bedrooms and a living room. Bed linen is included but beds are not made upon arrival. Towels can be rented on site. 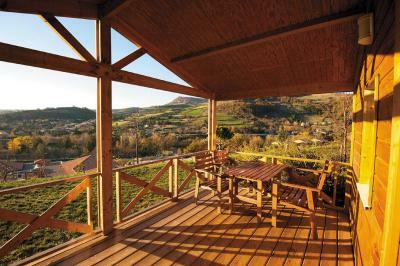 Located on the lower part of the estate, the chalet offers a terrace with a view on the valley. It offers 2 bedrooms and a living room. House Rules Domaine Saint Esteve takes special requests – add in the next step! Domaine Saint Esteve accepts these cards and reserves the right to temporarily hold an amount prior to arrival. Please note that the property's seasonal swimming pool is available from May to October, weather permitting. Please note that the reception is open from 8:00 to 20:00. Arrivals are from 16:00. If you plan to arrive after 20:00, please contact the hotel in advance. Contact details can be found on the booking confirmation. The restaurant is open every day for diner and on Sunday for lunch. It is only open during high season (summer). Only problem was we couldn't get in the restaurant as we hadn't booked and lady was on her own and couldn't take anymore diners. Food looked so good and all seemed to be based on local source ingredients. Book a table in advance I'm sure you won't be disappointed. Kitchen could be better equipped. Cutting board would be useful. Directions for microwave-oven. Limited menu at the restaurant. Expensive breakfast. Very small room, in fact just a cabin. very small bathroom. The bar was not open. Beautiful situation, good restaurant and breakfast. Clean room. Swimming pool with a view. The food at the restaurant was truly excellent. Location, could see the bridge from our buret Clean and comfortable. Restaurant already closed for the season by mid September. Laundry facilities on site and the view. The greeting we received when we arrived. They were obviously expecting a large group to stay, we felt we were an inconvenience. Told to be up early for breakfast as they needed to get the room ready for more guests. Shame as we intending to leave early anyhow. 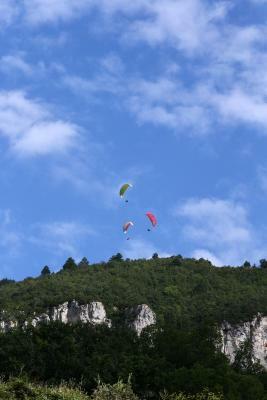 Great place, superb views, location okay for town, about 1.4 miles away. The room was nicely decorated plus had mozzy nets on the windows. Great night's sleep followed by very good breakfast. The owners were very friendly and recommended two absolute musts for a stay: firstly the Ornithological Park with a stroll amongst the flamingoes and herons etc. Secondly the Cours Hotel in Saint Gilles where we enjoyed one of our best meals in France for a long time and the price was reasonable.